Welcome to part one of the February 2016 members’ roundup. Over the past month CIMSEC members have examined several international maritime security issues, including recent Indian Navy maritime policy developments, aspects of the U.S. Navy’s defense procurement program, components of a notional South China Sea naval conflict between China and the U.S. and capability challenges for the U.S. Navy Littoral Combat Ship (LCS). Beginning the roundup at Offiziere, Darshana Baruah discusses India’s Cold War non-aligned strategy and the implications this strategy has had on India’s maritime security policy in the post-Cold War period. Ms. Baruah explains that India must realize that non-alignment does not equate to non-engagement and that committing to a policy of engagement is critical to manage the complexities of the developing Asian maritime security environment. She references the bilateral MALABAR naval exercises between the U.S. and India as well as the Maritime Security Strategy document released by the Indian government as developments hinting to a changing Indian maritime policy. Ankit Panda, at The Diplomat, also discusses India’s maritime strategy with an analysis on potential joint patrol operations in the South China Sea between Indian and U.S. navies. Mr. Panda highlights that there is no indication whether these jointly conducted patrols would reflect recent U.S. FONOPs or less contentious passing patrols, however, he notes that the potential for these patrols to occur reflects a shift in India’s maritime doctrine to ‘act East’. Also at The Diplomat, Mr. Panda explains the conditions and challenges of completing a Boeing-India F/A-18 Super Hornet deal where the Indian Defense Forces would receive an advanced multi-role fighter to supplement its next-generation indigenously built Vikrant-class aircraft carrier and raise the potential for increased technology sharing between the U.S. and India. Bryan McGrath, at War on the Rocks, discusses the concept of distributed lethality and recent weapons tests and developments that have brought this concept to maturity for the U.S. Navy’s surface force. Mr. McGrath explains how the successful launch of a Tomahawk Land Attack Missile (TLAM) from a U.S. Navy destroyer has now increased the anti-surface warfare combat range of about 90 U.S. cruisers and destroyers currently operating with the Vertical Launch System (VLS) to 1000 miles. Mr. McGrath also identifies the additional capability introduced to the long-range supersonic SM-6 missile, now capable of engaging enemy surface combatants, as a critical development for distributed lethality implementation across the fleet. Kyle Mizokami, for Popular Mechanics, discusses the planned purchase of 14 F/A-18 Super Hornets as a result of the fighter shortfall in carrier air-wings caused by delays in the Joint Strike Fighter Program. He explains that the delays will also reflect the slow introduction the F-35C will have entering into service within the Navy with only four planes to be purchased in 2017. Mr. Mizokami also outlines surface combatant purchases included in the Navy’s FY2017 budget, highlighting the procuring of two Virginia-class attack submarines and two Arleigh Burke-class guided missile destroyers – the destroyers to be equipped with the new Air and Missile Defense Radars that boost the ship’s ballistic missile defense capabilities. Also at Popular Mechanics, Mr. Mizokami provides an analysis on the U.S. Navy’s LCS live fire exercise against an enemy fast-attack swarm that demonstrated potentially serious flaws in the ships design, revealed by combatants entering the ‘keep-out’ range of the ship and technical issues arising throughout the test – albeit the exercise only tested certain weapon and fire control systems. To conclude the roundup in the Asia-Pacific, Harry Kazianis for The National Interest provides an outline of potential tactics China’s PLA would emphasize during a notional conflict with the U.S. Navy. Mr. Kazianis explains that over the past two decades China has feared the U.S. ability to rapidly deploy naval assets throughout multiple domains in China’s areas of interests largely due to limited PLA capabilities. Mr. Kazianis identifies the employment of large volumes of rudimentary sea-mines and missiles as a simple mechanism for overwhelming U.S. Navy defenses and a feasible strategy to achieve an asymmetric edge over U.S. fleets in theatre. Chuck Hill, for his Coast Guard Blog, discusses the possibility that the U.S. Army may develop an anti-access/ area-denial (A2AD) strategy along the First Island Chain in the Asia-Pacific and the implications these anti-air and anti-ship systems would have on the Army’s role in U.S. domestic coastal defense. 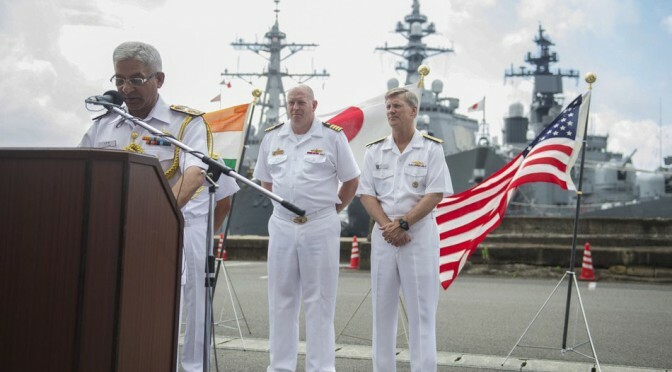 In a second article for his CG Blog, Hill outlines the participants and talking points of a multi-lateral coast guard meeting between the U.S., Japan, Australia and the Philippines. At USNI News, Sam LaGrone discusses the Request for Proposal Naval Air Systems Command is set to release later this year concerning the Carrier Based Refueling System (CBARS) or the unmanned aerial refuelling tanker. Mr. LaGrone explains how the CBARS is a follow-on program that will incorporate many components and systems from the Unmanned Carrier Launched Airborne Surveillance and Strike program (UCLASS). Robert Farley, for The National Interest, provides an analysis on the Zhenbao Island conflict between the Soviet Union and China in 1969 and how the sovereignty dispute nearly escalated to a nuclear confrontation. Mr. Farley explains the avenues of escalation that may have led to Soviet tactical strikes on Chinese nuclear facilities and the implications this would have had on U.S.-NATO-Soviet stability in Europe. James Stavridis, for Nikkei Asian Review, provides five strategies for Pacific-Asian countries that will reduce the potential of an outbreak conflict in the region. Mr. Stavridis suggests that direct military-to-military contact can create a framework of deconfliction procedures thereby reducing escalatory conditions within the region. He also explains how the use of international negotiation platforms to resolve territorial disputes can contribute to a sustainable stability. In an article at The Wall Street Journal, Stavridis highlights the ‘icebreaker gap’ the U.S. has developed with only four large icebreakers to be active by 2020 while Russia will have at least 42. He explains how acquisition processes to close this gap are extremely strained with the current defense budgetary restrictions the government is experiencing. Dave Majumdar, for The National Interest, explains how the next generation of U.S. Navy surface combatants will incorporate digital and information technologies into the core foundations of ship design to allow for time and cost efficient technological upgrades. In a second article at The National Interest, Majumdar highlights the strategy shift that has occurred within the U.S. Navy’s UCLASS approach. The article outlines how the move to CBARS away from the UCLASS ISR and light strike capability will assist the Navy in developing a sophisticated unmanned aviation infrastructure for future carrier operations. A popular quote reads “A ship in port is safe. But that’s not what ships are made for.” Correspondingly, one could quip “Navies are very good in constabulary tasks. But that’s not what they’re maintained for,” echoing noted political scientist Samuel Huntington in the process. More than sixty years ago, Huntington wrote about the purpose of naval forces in the early Cold War, yet some of his thoughts have an enduring value for 2016. In the Mediterranean, not one but two naval task groups are working hard to contain a humanitarian crisis at sea. While their service is admirable and strictly necessary, even as it is only a drop in a bucket, naval capabilities which are in high demand elsewhere are bound in a mission that is only a secondary role for navies. Instead, Germany should lead the way in investing in an EU auxiliary force. A crowded boat with migrants awaits rescue by EU NAVFOR MED. In May 2015, the German Navy began participating in the search and rescue mission in the Central Mediterranean north of the Libyan coast, dubbed EU NAVFOR MED (Operation “Sophia”) shortly thereafter. The pressure to act had become unbearable for political decision-makers in Berlin and Brussels after yet another devastating humanitarian catastrophe which occurred somewhere on the High Seas between Libya and Italy. 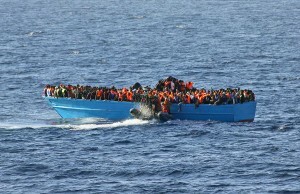 An overloaded boat sank during the night of 18/19 April, costing the lives of up to 800 migrants. Hundreds others had perished in the Mediterranean during the months before. 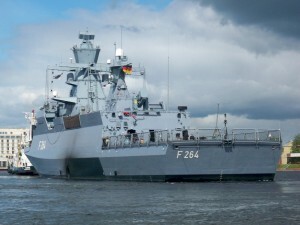 Following a European Council decision and a parliamentary green light, the German Navy dispatched the frigate Hessen (F221) and the combat support ship Berlin (A1411) to provide a presence north of Libyan territorial waters. At the time, both ships were operating off the Horn of Africa and in the Easter Mediterranean to provide the German Navy with an operational reserve. Hessen and Berlin joined a number of other EU vessels, which ranged from warships to auxiliary and coast guard ships. EU NAVFOR MED was just the latest mission that the German government engaged its shrinking military forces in; on the maritime domain alone, Germany is continuously involved in naval operations in the central Mediterranean (ACTIVE ENDEAVOUR, since 2002), off the coast of Lebanon (UNIFIL, since 2006), and on the Horn of Africa (EU NAVFOR Atalanta, since 2008). 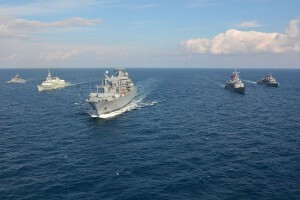 German Navy participation in one or often two of the four Standing NATO Maritime Groups, exercises, training, and out-of-the-schedule naval operations such as providing cover for the destruction of Syrian chemical weapons at sea in 2014 have added pressure to (wo)men and material. 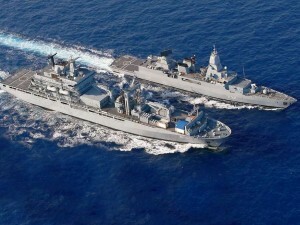 Combat support ship Berlin and frigate Hessen steam side by side in the initital provision of humanitarian assistance on the Southern flank. Since the summer of 2015, rotating up to two ships in and out of the EU NAVFOR MED mission – such as the Berlin’s sister ship Frankfurt (A1412), or the tender Werra (A514) – put a truly severe strain on German military-operational planning. It goes without saying that adapting these venerable warships and supply vessels, which are optimized for many things other than housing, feeding, and medically caring for hundreds of castaways on board, has put a strain on the Deutsche Marine. The noble task of saving lives at sea has challenged the well-trained crews of the ships, but it hardly obscured the fundamental problem that more than two decades of defense budget cuts, strategic disorientation, and a larger disinterest in all things hard power by the German public (and most of its political masters) have caused. By default, the German Navy has turned into a low-end, operationally-minded force, where high intensity should be a design guide. The German Navy’s dilemma, at 16,000 people and just 62 vessels at the smallest it has ever been by a December 2015 count, was illustrated best right before Christmas. In response to the November attacks in Paris, the frigate Augsburg (F213) was re-assigned from EU NAVFOR MED to provide air defense for the French aircraft carrier Charles de Gaulle in the Eastern Mediterranean and Persian Gulf. The mine hunter Weilheim (M1059), en route to return from UNIFIL to its homeport on the Baltic Sea right in time for the holidays (and probably the least-capable vessel to offer space for potentially hundreds of migrants), was tasked to remain in the Central Mediterranean. It joined the corvette Ludwigshafen am Rhein (F264), another warship tasked with a humanitarian assistance task that was hardly envisioned by strategic and operational planners in Berlin and Rostock, site of the naval command. Samuel Huntington, who warned that navies should concentrate on providing high end options and not be used for low-end missions, would probably turn over in his grave. This is not to say that other countries did not have their own challenges in providing assets to the mission, but some of them are better equipped to attend to low-end missions. The Royal Navy, for instance, dispatched HMS Enterprise (H88), a multi-role hydrographic oceanographic vessel. The corvette Ludwigshafen am Rhein is currently part of Germany’s contribution to EU NAVFOR MED. Germany’s naval missions can sometimes be as complicated as its ship-naming policy. Standing NATO Maritime Group 2, seen here steaming in formation, is currently tasked with operating on the Aegan Sea refugee route. Granted, the political leverage for European integration is low at the moment. The European Union is struggling to fend off tendencies that call not for an ever closer union, but in fact work towards dismantling some of the EU’s accomplishments in the wake of the refugee crisis. 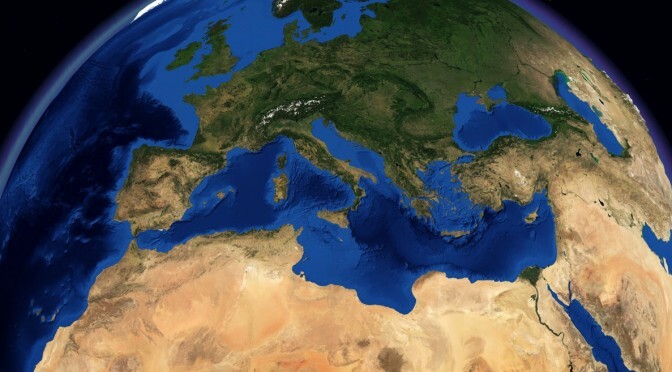 Still, with security and defense in increasing demand, including maritime security from on Europe’s southern flank, there need to be fresh ideas that can be operationalized quickly. 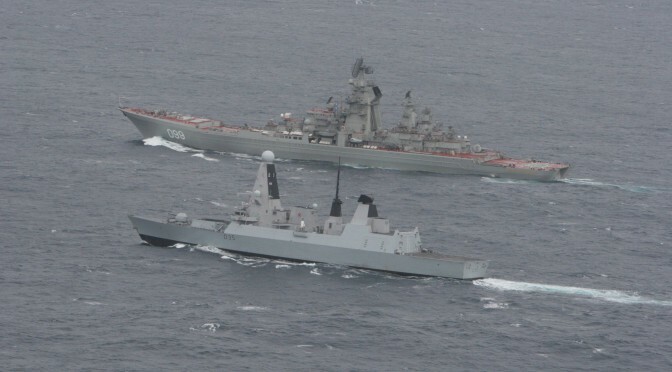 In the face of the deteriorating relations between the West and Russia and the disintegrating Middle East, warships should contribute to the more robust stance against political aggression and hard threats, thus focusing on more of their core tasks (no doubt requiring doctrinal and conceptual re-assessments in some European capitals). This would give NATO a stronger role, and leave the EU to take care of the low-end maritime task. It could thus serve as an example of burden-sharing between the two entities. Germany could play a leadership role in drawing up a European auxiliary navy, reenergizing the European spirit of cooperation in the process. Such a task force could have a number of political advantages. First, it would send a strong signal that European nations are willing to work together to address the ramifications of maritime trafficking. Second, Germany would address calls from inside and outside to do more. As a maritime nation with strong normative impulses, the Federal Republic would also demonstrate to the electorate (long weary of military engagement) that it is aware of the utility of naval forces in crisis response. Naturally, German investment into an auxiliary EU navy should not come at the expense of more robust naval tasks with the German Navy, but these could be better tailored if the combat support ships, frigates, and corvettes need not be used in lesser operations. Third, if and when the current migrant crisis ebbs, the European auxiliary navy could concentrate on the public diplomacy role of naval forces, providing anything from humanitarian assistance to the provision of medical services on goodwill tours around the world (like the U.S. Navy and the Chinese PLAN routinely do already). This auxiliary navy could also lend a hand to regional coastal and constabulary navies and coast guards (e.g. in West or East Africa) to train and exercise. 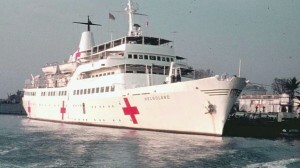 The last dedicated German hospital ship was the MS Helgoland, which saw extensive action in Saigon (South Vietnam) between 1966 and 1972. 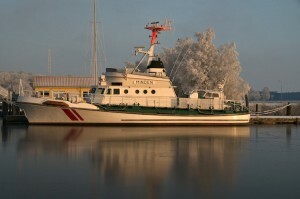 The ship was operated by the German Red Cross. To this end, it is strictly necessary to inject some fresh thinking into how such as force could be tailored. It is imperative that an idea such as this can be put into action rather quickly before being brought to grinding snail speed by bureaucrats in Brussels or Berlin. First, one should look at the market of commercial vessels. Ro/Ro ships or offshore supply ships are available, usually even on short notice. They could be painted gray or white, manned by a mixed civilian-military crew, and quickly form the backbone of an auxiliary navy. 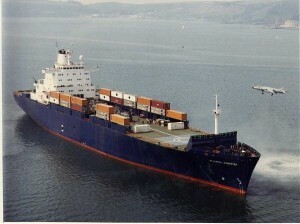 The Royal Navy used the Ro/Ro vessel Atlantic Conveyor in the 1982 campaign to retake the Falkland Islands from Argentina. The makeshift helicopter and Harrier carrier was sunk by Argentine forces in the course of the conflict. Other opportunities arise as well. The offshore patrol vessel L’Adroit (P725) is a demonstrator vessel built by French shipbuilder DCNS and was placed at the disposal of the French Navy for three years, a period that is now drawing to a close. The ship could be introduced as a French contribution to the auxiliary navy, which need not limit itself to state-run ships. If done properly, NGOs like SOS Mediterranee could be integrated (the non-profit organization operates the MS Aquarius, a former German fishery protection vessel). The former rescue cruiser Minden, built in 1985 and serviced by volunteers from the German Maritime Search and Rescue Service, will join what is already emerging as a multinational, civilian, and military task force in the Mediterranean. The former SAR cruiser Minden, for thirty years operated in the North Sea and Baltic Sea by an NGO, will soon begin rescue operations in the Mediterranean. In the medium term, one could consider the charter of vessels which could be converted quickly as dedicated hospital ships, also crewed by civilian mariners and military. A logistics ship would also come in handy, as well as a simplistic command platform. To provide range, ships taken up from trade (not such a novel concept after all) could be selected if they provide the opportunity to operate reconnaissance drones or helicopters. In the long term, there are even further ideas that could be floated. For example, the 2016 German federal budget has earmarked the procurement of three new patrol vessels for the Bundespolizei See, Germany’s quasi Coast Guard. It is entirely plausible that these ships could also be detached as part of the EU’s auxiliary fleet, akin to NATO’s SNMGs – that is, if Germany politically resolves its constitutional conflict between police and military jurisdiction and respective responsibilities. To go even further, the German Navy is currently in the early stages of procuring the future multi-role combat ship MKS180, designed as a modular warship. Is it too far-fetched to consider adding a civilian variant, a MKS180CIV, for the auxiliary “Great EU White Fleet”? 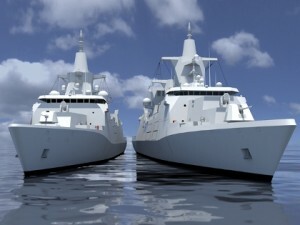 The German Navy’s next project: Multi-role combat ships MKS180 (artist conception). To be clear: Such an auxiliary navy would have to be organized, trained, and equipped properly. This requires financial and political investments. The task force, more of a 10-ship navy than a 100- or even 1000-ship navy, would provide a vision for European cooperation. EU or United Nations mandates would be desirable. It appears that it is also a much more sensible road leading to further defense and security cooperation than political soap-box oratories about the need for a European army could ever do. Politically and operationally, it could provide Berlin with a sense of regaining some degree of initiative when it comes to maritime security. Sebastian Bruns directs the Center for Naval Strategy and Security at the Institute for Security Policy, University of Kiel (Germany). He is the editor of “The Routledge Handbook of Naval Strategy and Security” (Routledge: London 2016). Welcome to part one of the January 2016 members’ round-up! Over the past month CIMSEC members have examined several international maritime security issues, including future development programs for the U.S. Navy, Japanese naval strategy in the Asia-Pacific, North Korea’s nuclear weapons test, legal discussions over the U.S. South China Sea Freedom of Navigation Operations (FONOP) and China’s aircraft carrier procurement challenges. Beginning the round-up at the Center for Strategic and Budgetary Assessments, Bryan Clark discusses the new Chief of Naval Operation’s vision for the future of the U.S. Navy. Mr. Clark explains that adaptability is a critical factor that the Navy must retain in order to effectively navigate the complex issues the force will see in the future maritime environment. Further to this, he elaborates on the potential challenges the Navy will face implementing an adaptability design as the Navy’s organization, training and equipping functions historically have not been developed for such fluid flexibility. Also discussing the CNO’s new design for the Navy, Chuck Hill for his Coast Guard Blog highlights the key developments raised within the CNO’s “Maintaining Maritime Superiority” document, including the changing dynamics of the global maritime environment and the recognition of increased competition U.S. naval forces are facing in the maritime domain from Russia and China. Sam LaGrone, at U.S. Naval Institute News, discusses the future surface combatant study taking place this upcoming summer. Mr. LaGrone explains that the study intends to comprehensively identify the capabilities that will need to be acquired by the Navy to effectively manage the threats the surface fleet will face in the future. Additionally, Mr. LaGrone highlights the strategic and fiscal importance of the future surface fleet having substantial multi-mission capability and an ability to remain relevant through technological advancements in weapon and sensor systems by ensuring the fleet is capable of handling frequent upgrades. Bryan McGrath, for Information Dissemination, analyzes the ongoing debate concerning the procurement of the Ford-class aircraft carriers and more generally, the strategic benefits the aircraft carrier brings as a key component of the Navy’s force structure. Mr. McGrath outlines five underlying features surrounding the current debate, including the immediate costs of procuring large high-end carriers and the necessity for the air-wing to evolve to provide long-range stealth-strike capabilities, sea control, organic refueling and intelligence, surveillance and reconnaissance (ISR) operations. Entering the Asia-Pacific, Harry Kazianis for The National Interest examines Japan’s strategy to develop an anti-access/ area-denial (A2/AD) capability to restrain Chinese naval and air operations in the region. Mr. Kazianis explains that a primary component of this strategy is the placement of anti-ship and anti-aircraft missile batteries along 200 islands in the East China Sea stretching 870 miles from mainland Japan towards Taiwanese territory. 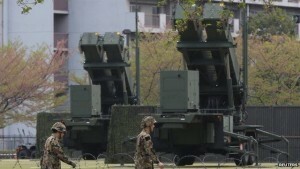 Members of the Japan Self-Defence Forces deploy Patriot Advanced Capability-3 (PAC-3). BBC, 2013. Mira Rapp-Hooper at Lawfare provides a breakdown of Defense Secretary Ash Carter’s detailed explanation of the USS Lassen’s South China Sea FONOP. Ms. Rapp-Hooper explains how Carter’s letter clarifies that freedom of navigation operations are merely intended to challenge excessive maritime and territorial claims according to international law and not to affirm support for any country involved in the dispute. She also outlines the letter’s second key assertion, which states that the USS Lassen operation in the South China Sea was consistent with the principle of ‘innocent passage’, suggesting that the operation consisted of no illegal activities or actions. 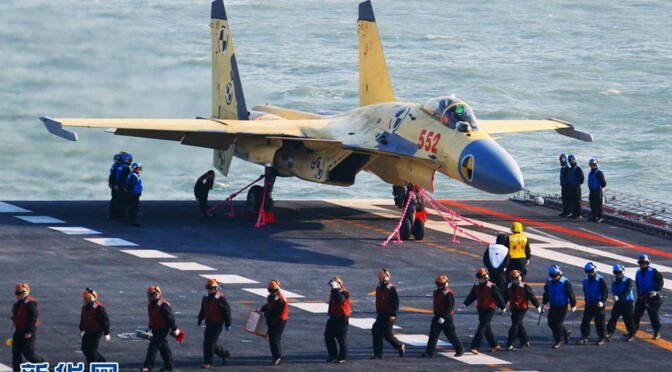 To conclude this edition of the member’s round-up, James Goldrick at The Interpreter discusses recent developments in China’s aircraft carrier program and outlines the PLA-N’s intentions for at least four carrier battle groups to be introduced as a means to support Chinese maritime and security interests in the region. Mr. Goldrick explains that for China’s carrier program to yield successful results, the volume of indigenous Chinese expert shipbuilders needs to substantially increase to meet the design and concept demands their high-end naval programs are requiring – including the PLA-N’s conventional and nuclear submarine development programs. Eric Hahn, for Blue-Value Facilities Engineering, explains the importance and strategic value of superior simulation and modeling concerning the development of the U.S. Navy’s future ‘adaptable’ fleet. He adds that using modeling and simulation can contribute to effective design development, which can ultimately reduce costs and delays of weapon system procurements and increase operational availability. Kyle Mizokami, for Popular Mechanics, examines the features of the U.S. Air Force’s new delivery system for a tactical nuclear weapon – the B61-12. Mr. Mizokami explains that the weapon system has standoff capabilities, a low explosive yield and is extremely accurate from afar, which has contributed to critics arguing this precise low-yield nuclear weapon has the potential to be ‘talked into use’ and severely increases the threat of nuclear confrontation. Scott Cheney-Peters, for The War on the Rocks, provides a novel review for fellow CIMSEC member Claude Berube’s new book, Syren’s Song: A Connor Stark Novel. Cheney-Peters outlines parallels between naval operations in the novel and the real-world implications of such strategies and weapon systems. Paul Pryce, at Offiziere, discusses the rise of the light attack fighter as an alternative air combat system to the high-maintenance and expensive fourth and fifth-generation jet fighters typically used to modernize a country’s air force capabilities. Mr. Pryce highlights the Russian Yak-130, the Chinese JF-17 Thunder and the U.S. Textron Scorpion as examples of inexpensive planes being introduced as alternative fighter or ISR aircraft throughout the world – including, the Philippines, Bangladesh, Belarus and Algeria. Ankit Panda, for The Diplomat, explains the circumstances that led to the Iranian Navy capturing ten U.S. sailors in the Persian Gulf and highlights the initial search and rescue response taken by the Harry S. Truman Strike Group after communications were lost. Mr. Panda shares another article at The Diplomat examining North Korea’s progress on submarine-launched ballistic missiles and explains the evidence demonstrating the SLBM tests released on video were likely altered and falsified. Dave Majumdar, for The National Interest, discusses Vietnam’s negotiations with American and European manufacturers to purchase advanced fighters, patrol aircraft and unmanned systems to reduce its dependency on Russia for military hardware while also increasing its capabilities to counter China’s growing power. At CIMSEC we encourage members to continue writing, either here on the CIMSEC site or through other means. You can assist us by emailing your works to dmp@cimsec.org. Is Russia’s Maritime Strategy Adrift? This article originally appeared on The Strategy Bridge. You can read it in its original format here. This article originally featured on CIMSEC on Aug. 20, 2015, and has been updated for inclusion into the Russia Resurgent Topic Week. The Russian defense industry has always had a flair for the dramatic. The Soviet military-industrial complex carried so much sway in the Politiburo that at times, it operated with little oversight from the General Secretary.1 It produced wonder weapons and prestige platforms with little regard for their cost and strategic value. The past few years have seen a resurgence of this mindset. Russia has embarked on a massive recapitalization project, seeking to replace aging Soviet-era platforms that were often built to lax production standards. Their military-industrial complex takes great pride in trumpeting its achievements and ambitious projects through Russian language media and state-owned foreign language outlets, such as RT.com. While it is important to listen to what an adversary is saying, it is also important to see what is behind the bluster. In fact, many of Russia’s wonder weapon projects are far too grand to come to fruition — and may even signal a revival of the same discord within the Russian defense industry that plagued the Soviet Union; a discord that acted as a key forcing-function in the destabilizing Cold War arms race that brought the world to the brink of ruin. Evidently, the RFN has even grander designs: a squadron of what would effectively be nuclear powered battlecruisers. Consider the notional future Russian Federation Navy (RFN). Their fleet, once outnumbering the U.S. Navy 3.5:1, now spends most of its time in port. 2 Russia’s major shipyards are now going full tilt, building frigates and nuclear powered — and armed — submarines. Evidently, the RFN has even grander designs: a squadron of what would effectively be nuclear powered battlecruisers. Dubbed the Lider class, these warships would feature the nuclear power and armament capacity of the massive Soviet-era Kirov battlecruisers. For reference, the 28,000 ton Kirov class has thrice the displacement of and carries roughly twice the armament of its nominal U.S. Navy counterpart, the AEGIS cruiser. Cutting a distinctive silhouette, the Lider would easily outgun the largest ships in the US or Chinese arsenals. Their nuclear power plants would allow them to sortie worldwide, limited only by food and ammunition supplies — the finest naval power projection to be found outside of aircraft carriers. 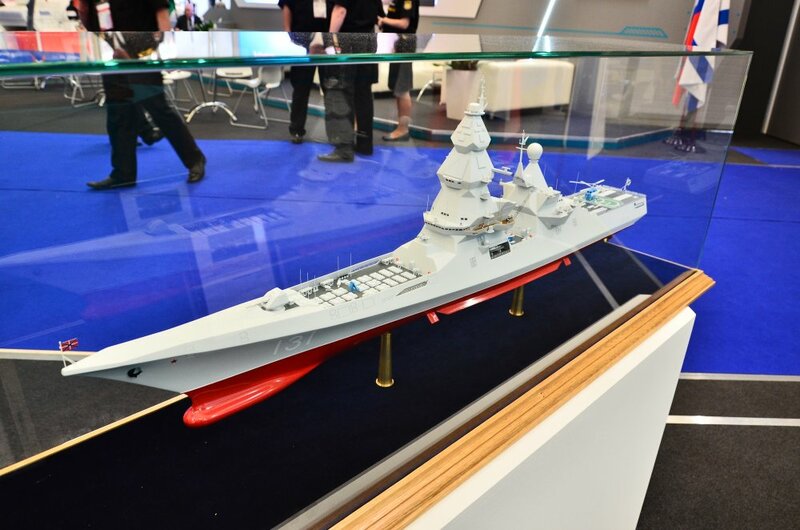 Building these battlecruisers will almost certainly devour the vast majority of Russia’s shipbuilding budget and capacity. Russian officials announced they will build twelve of these battlecruisers.6Realistically, most observers should expect to see one or two. A ship’s size tends to drive the cost of constructing it, and there’s a catch to building ships with the massive weapons capacity and power plant of the old Soviet battlewagons: they’re probably going to be about the same size. Some sources suggest they’ve even been designed by the same firm responsible for the Kirovs.7 This implies the Lider will be a budget breaker like its predecessor. Russian designs on this Lider class represent a gulf between strategic direction and capabilities. Building these battlecruisers will almost certainly devour the vast majority of Russia’s shipbuilding budget and capacity. If the RFN succeeds in acquiring them, it will find itself with a handful of massive power projection tools unsuited to any of the conflicts it is most likely to fight. One side is building towards a strategically defensive Cold War-era doctrine, the other toward an essentially all new doctrine based on power projection. The Russian military is at a conventional disadvantage against NATO. As oil money begins to dry up and sanctions take their bite, the Russians do not appear to be adjusting their acquisition efforts to compensate. On one hand, they appear to be gravely concerned about the security of their nuclear deterrent. The Strategic Rocket Forces, fearing US missile defense efforts, have invested heavily in new ICBMs. Similarly, the submarine force is building new ballistic missile submarines and advanced new missiles to go with them. On the other hand, the Russians are also attempting to achieve some kind of conventional parity with NATO by producing new stealth fighters, tanks, and apparently battlecruisers. A budget is by definition zero-sum, and as Russia’s economy slowly recovers from its free-fall, the money to build all their desired means simply will not exist. This could leave Russia with an arsenal of top-of-the-line nuclear weapons while intensifying its conventional disadvantage against NATO. Russia’s plans to build nuclear-powered battlecruisers is emblematic of a dangerously non-coherent national military strategy which haphazardly fuses Cold War paranoia with modern revanchism. So, what is there to worry about here? Why not celebrate as the Russians procure themselves into the hole, spending exorbitant sums to acquire prestige platforms that do not contribute to their strategy? Because Russia may well attempt to achieve its ends through whatever means are available. The weaker and less focused its conventional forces are, the more likely it is to resort to the use of tactical nuclear weapons to win a conflict with NATO. Painted into a corner by their belligerence and poor acquisition decisions, Russia may become dangerously prone to acting upon its “escalate to de-escalate” doctrine. Russia’s plans to build nuclear-powered battlecruisers is emblematic of a dangerously non-coherent national military strategy which haphazardly fuses Cold War paranoia with modern revanchism. It seeks to achieve ends (building a “buffer zone” of pro-Russian states by force while protecting its nuclear deterrent) through dangerous ways (“hybrid” and conventional warfighting, with the option to “escalate to de-escalate”) without the means to fully execute those ways. The end result could be disastrous for all involved. Ben Hernandez is one of the hundreds of students under instruction at Naval Station Newport, R.I. The views expressed here are the author’s alone and do not reflect those of the U.S. Navy, the Department of Defense or the U.S. Government. Read other contributions to Russia Resurgent Topic Week. 7 Hassan, Abbass, World Defense Review, Russian Navy approves the proposed future destroyer, 14 February 2013, accessed 17 July 2015. Thanks to Rich Ganske and Tyrell Mayfield.